You create custom rules for your Github repositories. We monitor your repositories for rules violations. We send you instant alerts when a violation happens. Setup custom rules around pull requests, commits and committers for all your Github repositories. For example, you create a rule that says "no direct commits are allowed to the master, develop or production branches". We will monitor all of your repositories for any rules violations from any members on your team. For example, a new member on your development team commits directly to the master branch, we are notified by Github of the violation. You will receive instant, unlimited notifications via Push, Flowdock, Slack and/or Email. You can customize Flowdock notifications for one repo, Slack notifications for another repo, or get all notifications for all repos. Developers who want to encourage their co-workers to follow good commit patterns. Team Leaders who have a specific set of rules they want to enforce on their dev team. CTOs & Managers who have multiple teams and multiple code bases to keep an eye on. OSS Maintainers who want to ensure their collaboration team follows a standard set of rules. deleteAny of your protected-branches are deleted. lock_openYour repositories change from private to public. keyboard_tabAny of your protected-branches are force pushed to. device_hubAny of your protected-branches are directly committed to. group_addA new team or outside collaborator is added to your repository. sms_failedA pull request is merged into a protected-branch with no comments. contactsA pull request is merged by somebody not on your "authorized mergers" list. 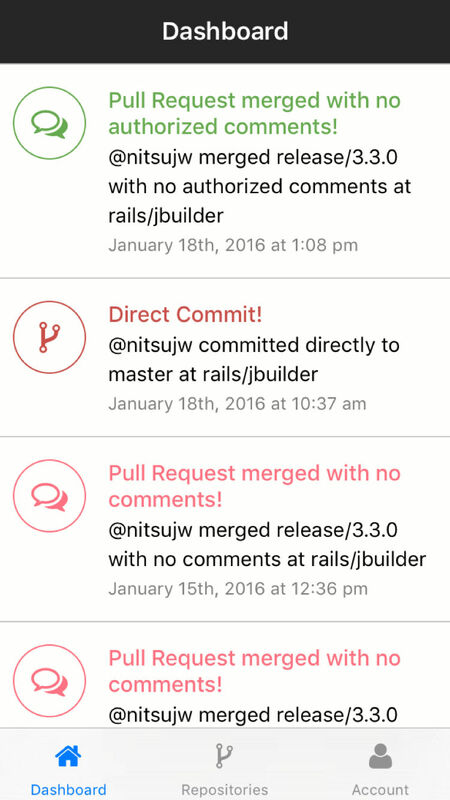 commentA pull request is merged without a comment from your "authorized comments" list. securityA file or directory from your "protected files" list is modified or deleted. plus_oneMore rules are being added all the time. Sign up to use them all!